Eagles running back LeSean McCoy scores on a 22-yard touchdown pass from quarterback Nick Foles. Photo by Webster Riddick. PHILADELPHIA—Perhaps the biggest questions for the Eagles coming into the 2014 season is how much has their defense improved and can the offense put up even bigger numbers than they did last season? On the defensive side of the ball, the answer has come with some uncertainty throughout the preseason. Last week against the New England Patriots, the Birds starters and reserves got pushed up and down the field for over 400 yards of offense. 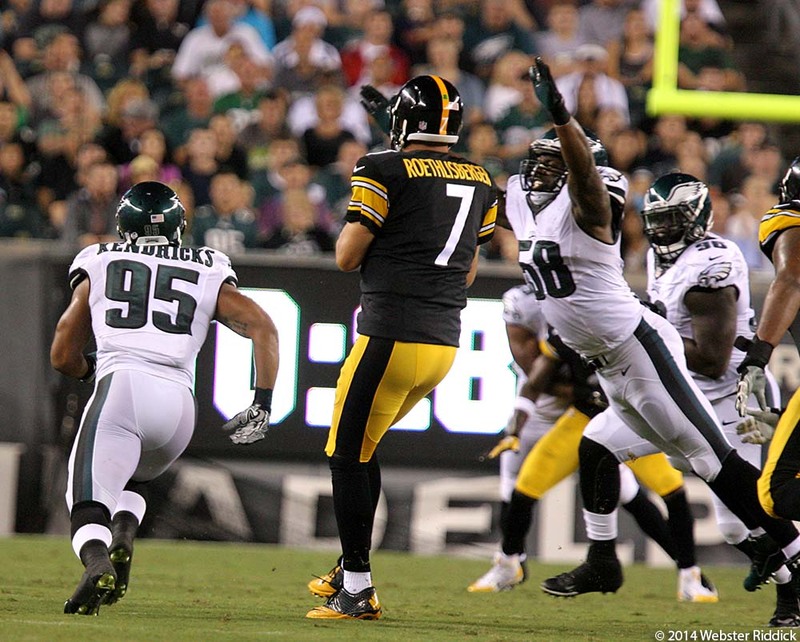 The Eagles starters on defense got a better sense of themselves in the Birds 31-21 win over the Pittsburgh Steelers Thursday night at Lincoln Financial in the pivotal third preseason game, considered to be a dress rehearsal for the regular season. Mychal Kendricks and Trent Cole go after Steelers quarterback Ben Roethlisberger in Thursday’s preseason game at Lincoln Financial Field. Photo by Webster Riddick. The Birds held Ben Roethlisberger and the Steelers offense to 94 yards in the first half before letting the second team take over late in the first half. It was a good bounce-back from their performance against the Patriots. What impressed defensive coordinator Bill Davis was the way his team got off the field on third down situations, something they didn’t do against the Patriots. The Eagles starters were 3-of-7 in stopping third down conversions. With the season-opener against the Jacksonville Jaguars (Sept. 7) on the horizon, the defense still has a lot of work to do to be ready for the regular season. The only disclaimer to the Eagles improved play on defense is that they were facing a bad Steelers offense that couldn’t get out of its own way. Roethlisberger was out of sync with his receivers and they just couldn’t establish any kind of rhythm offensively. Quite frankly, the Steelers were just awful on offense and didn’t get on the scoreboard until the second half when the Eagles second team took the field. If there’s a unit that is ready to start the season, it’s the Eagles offense. During their stint on the field in the first half, the Birds first-team offense rolled out to a 17-0 halftime lead on a 22-yard touchdown pass from Nick Foles to LeSean McCoy, a one-yard run from running back Darren Sproles and a 36-yard field goal by Alex Henery. With the preseason behind the first-team starters on offense, the Birds seem to be pleased with the progress they’ve made from the first preseason game against the Chicago Bears. Eagles wide receiver Jeremy Maclin grabs his right knee in pain after his foot apparently got stuck in the turf. He was not seriously injured. Photo by Webster Riddick. The one thing the Eagles will have when they open the season is their starting wide receivers—Riley Cooper and Jeremy Maclin. 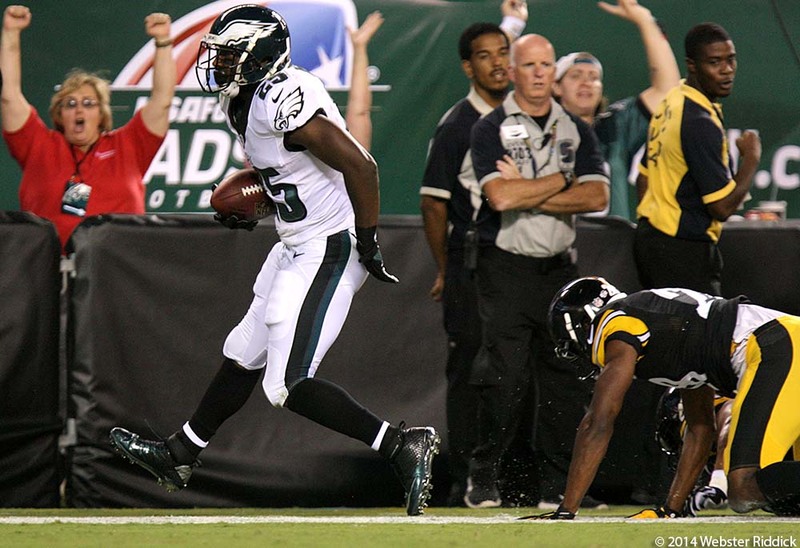 Things got scary midway through the first half when Maclin’s right knee buckled into the Lincoln Financial Field turf. The crowd held its collective breath with Maclin writhing in pain from the same knee that put him on the injured reserve list last season. After returning to the sideline, Maclin started running like normal and eventually got back out on the field. But he admitted that he got a little worried. The Eagles have one last preseason game next Thursday (Aug.28) against the New York Jets at Lincoln Financial Field. The game will be played by second and third string guys still trying to make the team. Eagles are due to have a good season this year. Go Philly! !